Freelance Confidence needs a podcast. I am already part of A Little Bird Told Me, a freelance writing podcast with my freelance colleague Lorrie, but since she has been on maternity leave we haven’t made an episode. Freelance Confidence’s podcast is going to be different, though, and it won’t be a competitor (that would be confusing, competing against myself!). In ALTBM, we go into depth and talk for 20 – 80 minutes each time, but I have been thinking about the benefits of those podcasts that publish episodes that are just a few minutes long, covering a quick topic per episode. As a podcast addict myself, I have been missing sending my voice out there, and I don’t want to fizzle out before I’ve started. So I came up with #podtober. Go on then, what’s #podtober? I will publish a podcast a day, every Monday to Friday in October. If I succeed, then by the end of the month, the Freelance Confidence podcast will have an epic 23 episodes, which is a really, really good start. My plan is to optimise my process and do most of the work on my phone. It will be interesting to see just how efficient I can make it, so that the process of publishing does not become an obstacle in my way. Do you want to join me in this ridiculous challenge? If you’re thinking of launching a podcast, what a way to make an impact! An episode every day, Monday to Friday, through the month of October. A community can form under the #podtober hashtag, so we can share each other’s episodes and support each other’s endeavours. Let’s do this thing. 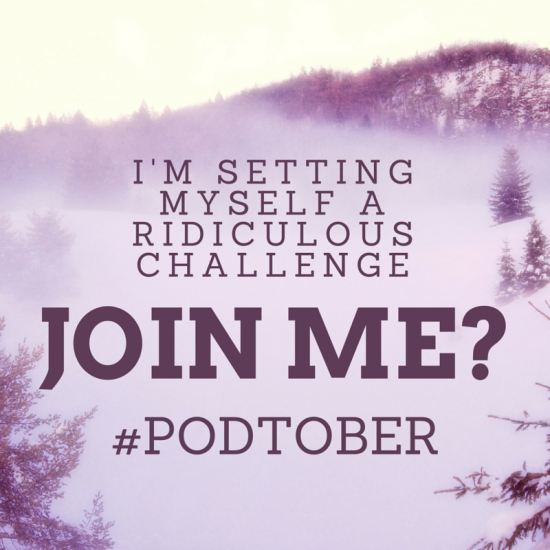 Share your plan to do #podtober on Twitter, to make sure you stick to your word! Share the post "I’m setting myself a ridiculous challenge. Join me? #podtober"